Sunday was a beautiful day so we decided to put the harness on Frankie and let him outside. He has been terrible lately with his picking at the screen by the front door. Counting yesterday, he has pulled the entire screen off the window at least five times, three times after I put tape on it to hold it in and once after I put extra tape on it. Rose thinks he was an outside cat and we are being cruel forcing him to stay inside. I understand her concerns but I think we live too close to a busy road for that to be an option. Perhaps if we lived down the road a bit I would consider getting him a collar and letting him out during the day. I got Rose’s help and let all the cats out the back door on Sunday. I held Frankie’s leash while Rose watched Chris and Puck. Everything went pretty well for a while then Rose yelled to me that Puck had caught a lizard and brought it in the house. She wanted me to get it out but I had to get the cats in first so I gave her Frankie and went to get Chris. While I was trying to catch him he caught a lizard too. I gave him to Rose who was able to get the lizard out of his mouth while I went inside to find Puck. He was in the bathroom where he had dropped the lizard into the litter box. Not sure what his plan was but I scooped up the lizard and put him outside. I brought my new camera with me and took a video but unfortunately I had replaced the memory card with one that was too slow to handle video so it kept shutting off after a few seconds of shooting. I also tried to get a picture of Chris with a lizard bit he moved too fast for a good shot. 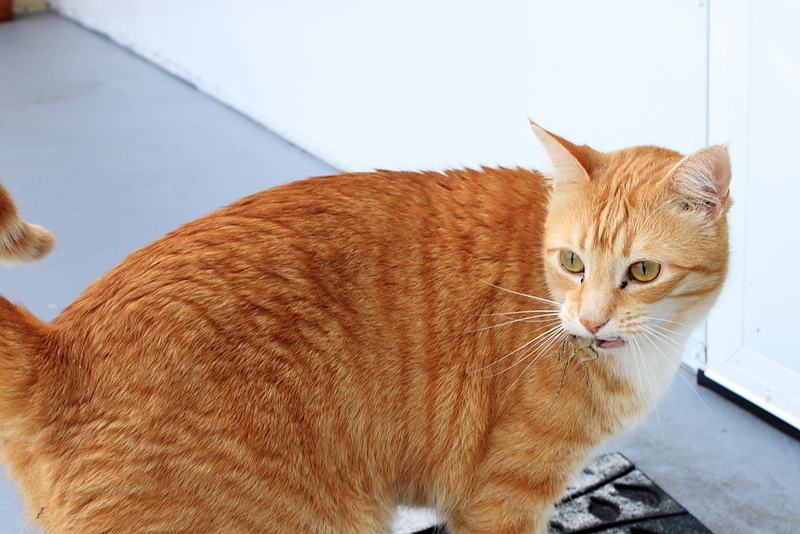 This entry was posted in Uncategorized and tagged Cats, harness, hunter, leash, lizard, outside on February 11, 2015 by Charles Huss. The other day Chris was outside and caught another lizard. That is bad enough but he has this irresistible urge to bring his catch into the house and doesn’t know what to do with it when he can’t get in. I’m not sure why he has to bring it inside. At first I thought it was instinctual but then I realized that lions don’t kill a gazelle and then drag it back to the den to eat it. Maybe he just wants to show it off to Puck and Frankie. 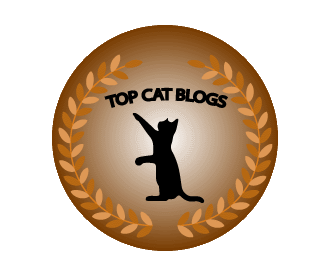 This entry was posted in Uncategorized and tagged cat, funny, hunter, lizard, Video on October 8, 2014 by Charles Huss. About a week ago, we noticed that Puck was spending a lot of time in the bathroom. No, he does not have a medical condition. He would just hang out in there. Sometimes I would see him sleeping in the bathroom and other times he would be staring up toward the ceiling. Rose and I wondered if there was a bug that the other cats failed to notice. Perhaps there was the sound of a rat in the ceiling. We didn’t know but we found out the other day. The call came from Rose while I was in the kitchen. Chuck! Come Quickly! Oh my God! Hurry! 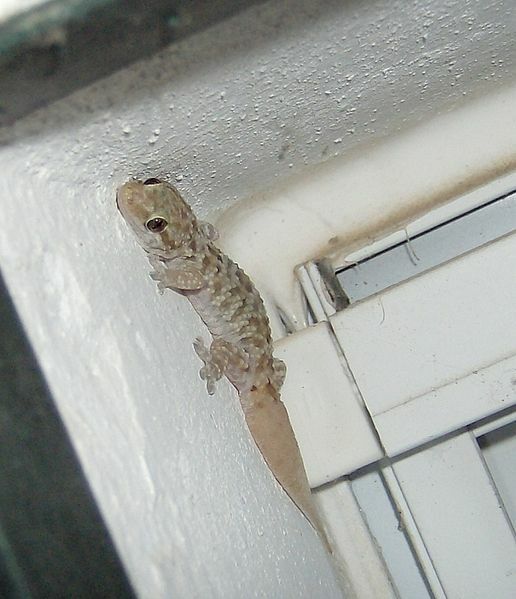 Mediterranean Gecko. 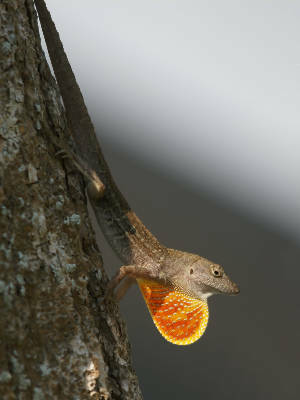 It is not native to Florida and looks so different from the lizards we usually see (there is a variety but most are called Brown Anoles) that it caused Rose to get pretty excited. We think it was hiding out behind the picture and Puck knew it was there. It was missing its tail so I assume Puck came close to catching it. I got a towel and with much effort finally managed to catch it and bring it outside. 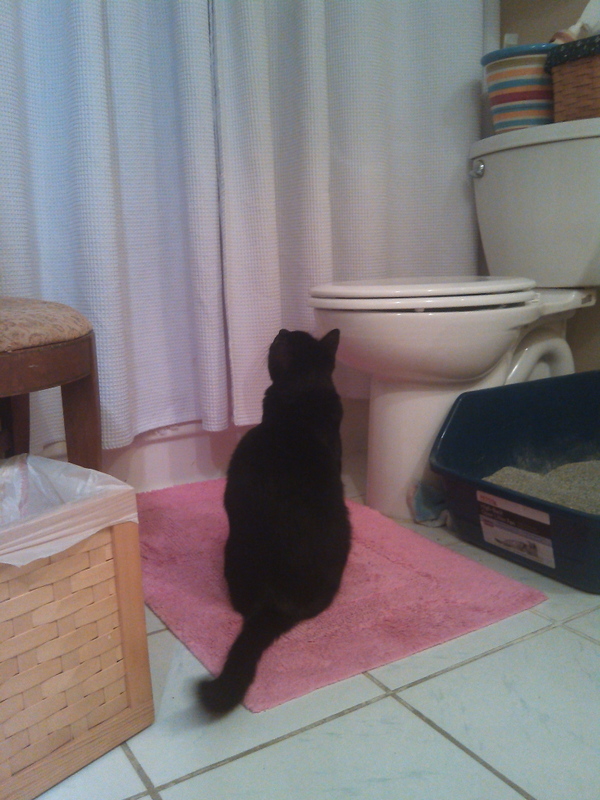 Puck did not realize I had caught it and he is still holding vigil in the bathroom, three days later, waiting for the gecko to slip up. Or he’s just looking to save fifteen percent on car insurance. I cant be sure. Note: If you live outside the U.S. and don’t get the car insurance joke than click here. This entry was posted in Uncategorized and tagged bathroom, Brown Anole, cat, lizard, Mediterranean House Gecko on August 24, 2014 by Charles Huss. On this occasion I decided to let Puck out too but Frankie had to stay in because he’s a runner. Chris went straight to eating grass as usual and Puck walked about twenty feet and then came back. He started talking to Frankie and pawing at the screen, as if he was pleading with Frankie to let him in. Apparently he forgot where the door was. I noticed there were many people near the pool and I’m sure that made him nervous. I guided him to the door and tried to get him inside before Frankie came out. I then went back to grilling. After a little while I needed to go in for something and decided Chris had spent enough time outside. Instinctively Chris knows when I am coming to bring him in so he bolted away from me. At that very moment he noticed a lizard and grabbed it. Now he was ready to go inside. I tried to pry his mouth open to get him to drop the lizard but his jaws were locked shut. He also growled at me to show his disapproval in my behavior. I then thought if I just gave him time, he would eventually want to put the lizard down to play with it but he just stood by the door, with legs and a tail hanging from his mouth, waiting for someone to let him in. For some strange reason all small animals and insects must be played with inside the house. I don’t know why Chris has this rule but while he was standing by the door I thought maybe he has a bit of OCD. He hung on to that lizard for a good five minutes, pacing pack and forth. Eventually it stopped moving and he put it down to check on it. That is when I grabbed him and brought him in. Unfortunately, I wasn’t done cooking. I had to bring in the kabobs and bring out the Zucchini. It wasn’t worth fighting with Chris so I let him out again. He just laid down next to the door while I tended to the grill. After a short time the food was almost done and I thought I would put Chris in first. Of course he ran, this time behind the grill where he saw a lizard on the propane tank. There is also a spare tank next to it under the grill and Chris jumped on top of the two tanks while the grill was on, and ended up with another lizard. Bad Cat! Suddenly he was ready to go inside again. I had to wait him out again. Eventually he walked around behind the screen where the air conditioner is and dropped the lizard and stepped on it to keep him close. That was my chance to grab him but I was too slow. I’ve noticed this before but it never really registered until now that cats catch their prey with their front paws and then grab it with their teeth. Finally, after what seemed like a long time, I was finally able to get Chris away from the lizard. This one was still alive so I picked it up and put it in the grass before bringing Chris inside. I used to worry about the lizard population until Chris started focusing on eating grass when outside. It looks like the hunter is back. 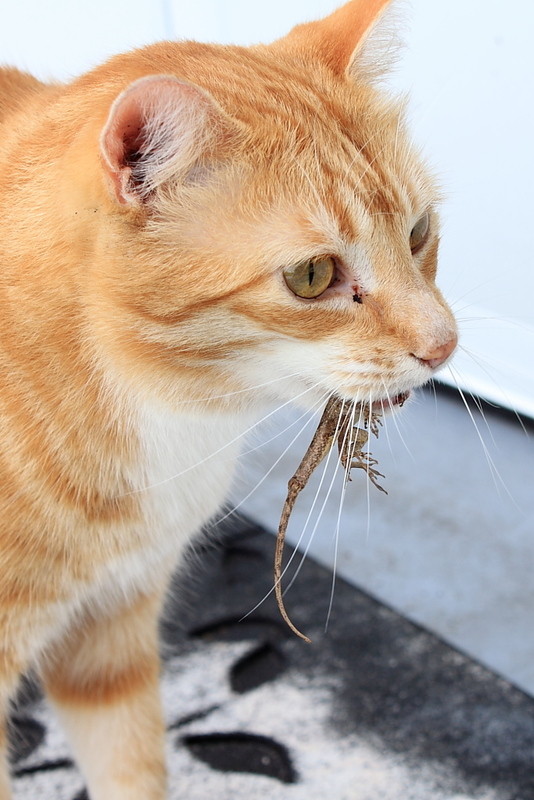 This entry was posted in Uncategorized and tagged Bad Cat, cat, hunter, lizard on April 8, 2014 by Charles Huss. Chris got out last week when I was bringing groceries in the house. When that happens, it is just easier to leave him out until I get everything in the house and then go get him. He spent the whole time eating grass and rolling around on the sidewalk until he knew I wanted him in. He then made me chase him. As he was running away from me a lizard caught his attention and he quickly caught it… Then he was ready to go in the house. 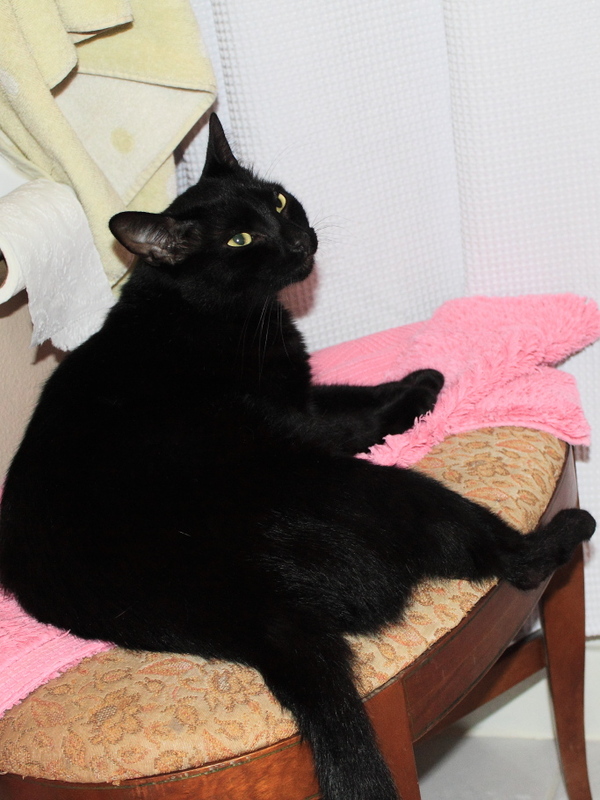 This entry was posted in Uncategorized and tagged Bad Cat, hunter, lizard on March 26, 2014 by Charles Huss. I woke up this morning just before 2 a.m. because I had a very bad headache. I got up and went into the bathroom to get a couple of aspirin. I thought we had some in the medicine cabinet but it seemed we were out and I didn’t want to wake up Rose to ask her where they were so I checked everywhere I could think of inside the bathroom. While I was doing that, Puck ran by the bathroom door with Chris hot on his tail. He then ran by again while Chris continued to give chase. Soon he ran into the bathroom and stopped under Rose’s make-up chair, right next to the bathtub. I could see he had something hanging from his mouth. It looked like a lizard but it seemed pale and had no tail. Puck stood there with Chris by his side. He was making a strange noise that sounded like a growl, cry and purr all at once. As I looked closer I saw that it was a lizard hanging from his mouth but it wasn’t moving so I assumed it was already dead. Just then Puck dropped it and it took off running. It got about six inches when Puck put his paw on it and stopped its forward momentum. It got away again and started scrambling up the wall when Chris stepped in and put his paw on the lizard and knocked him back to the floor. When it hit the floor, puck pounced on it and picked it up again and left the bathroom with Chris in pursuit. I heard the cat-door flap swing open twice, indicating both cats were now out on the patio. That was the end of that. It occurred to me that for that thirty seconds my headache seemed to disappear. It quickly came back with a vengeance. I eventually found the aspirin but after taking it I found I could not lie down because my head hurt worse while I was in that position. I ended up sitting up in the living room for two hours waiting for my headache to go away. I think maybe Chris sensed I was not feeling well because he stopped his lizard hunting and stayed with me for most of that time. As bad as he is, there are times when he can be a good cat. This entry was posted in Uncategorized and tagged cat, headache, hunting, lizard on July 2, 2013 by Charles Huss.